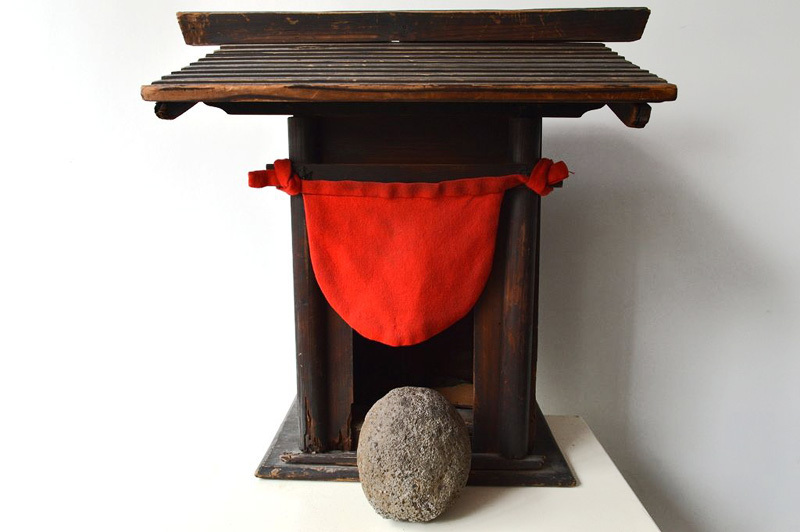 ROUND STONE GOD IN THE SHRINE (Dealer: titcoRet) – So-called ‘Maruishigami’ (lit. ‘Round stone god’) only seen in Yamanashi Prefecture as one of the most mysterious existences (form of worship) in the Japanese local folk beliefs. Also, uniquely known well as the various ways (places) of its enshrinement (at the field path as ‘Dososhin’ (Traveler’s guardian deity), or at the shrine, or at the private house) with no specific form of religions or deities, like “Too abstract and too natural, with no rule”. This one is enshrined within such a wooden shrine (in originally damaged condition, with stain) as is. 19th century.